Conveniently located at 1600 Park Avenue, Jans is the only fly shop in Park City where you can purchase a Utah Division of Wildlife Resources Fishing License. And we have everything you need to go with the fishing license - our fly shop carries the most complete selection of flies and accessories in Park City (and our expert fly fishing guides will help you make the most of your precious time). We carry rods from Sage, Redington, Simms and Chota - and we offer demo rods so you can take the rod out on the water and try it before you buy it! We have chest waders and boots, rods, reels, vests, hats, books - everything you need for the most rewarding fishing adventure! Park City Fly Shop is owned and operated by Chris Kunkel and his family. Chris and his family which includes Hank and John Boehm Chris,s brother-in-law and Nephew have been fly fishing for three generations now in the Western Mountain Region, and from this they have gathered and passed down a knowledge and respect for the sport that will make your guided trip with Park City Fly Shop an experience you will not soon forget. Chris and his guides have over 60 years combined guiding experience and are some of the best in Utah and the Western Mountain Region. Park City Fly Shops main focus is on guiding our clients on great trips they will remember for a lifetime,new waters ,new fish ,new stories,and building relationships that last for years to come.Come join us on a trip and learn some new secrets,practice your skills as our guides love to teach,and of course catch some quality wild trout. Trout Bum 2 is the premier fly shop & fly fishing guide service in Park City, Utah. We fly fish and guide on the Provo River, Green River, LC Ranch and many other Utah rivers and streams. We are your source for the best & most experienced fly fishing guides, fly fishing gear & information on fly fishing in the Park City, Utah area. We live, work and play in the rivers of Utah including the Provo River, the Green River and many other great Utah waters. Let us show you the phenomenal fly fishing Utah has to offer! We offer professionally guided Utah fly fishing trips 12 months a year, on rivers, streams, and ponds near Park City. 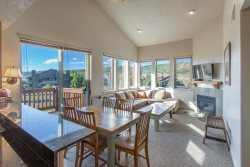 Whether you�re here playing golf in the summer, playing on the ski slopes during the winter or attending the Sundance film festival we have a great alternative for you. Come spend a day you won�t forget fly fishing with us.